"You have slept for millions and millions of years. Why not wake up this morning?" A Trail Through Leaves by Hannah Hinchman. 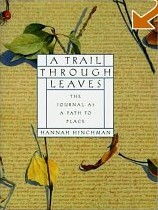 A Trail Through Leaves (1997) by Hannah Hinchman. Book log of A Trail Through Leaves. About half the book has illustrations taken directly from her many journals. Includes a few exercises. Mostly teaches by example. Sadly, includes no index. I can read the book or skim it. But I can't use it as a reference. Skip over the text of this chapter. I nearly abandoned the book here. But later chapters are much better. Simply mix colors. Paint small squares on paper and watch the way they dry. Layer other colors on top of the wet and dry squares. Mix opposite colors to get grey tones. Explore colored pencils. She uses Prismacolors and Derwent Artist's Pencils. "Don't let the materials intimidate you. Err on the side of boldness, in pushing them to the limits and beyond. You can always go back to restraint and subtlety. But be willing to wallow in the colors, shapes, and surfaces." Feeling It in Your Bones. "The best way to avoid the trap of dead words is to keep a firm grip on the real stuff, prickly, slimy, or bony as it may be." Develop "body empathy." "With a picture of a human skeleton in front of you ... fill a page with fanciful and speculative sketches about how the same bones could be transmuted into dog, cat, horse, bird, gerbil." "Grasp 'wholeness' ... get better at reading the body language of the world." "Use the journal to interview your body. Which muscles are nderused, and which are hardy and durable? ..."
The Power of the Ordinary. "Make a series of drawings that illustrate your typical day." "Practice turning unpleasant events into funny ones. Next time you have a truly foul day, transform it in the journal by emphasising the ridiculous, the idiotic, the absurd." "Use the journal to interview your body. Which muscles are underused, and which are hardy and durable? ..."
'You have slept for millions and millions of years. Why not wake up this morning.'" "A day-long entry [that] creates an unusual cross-section of a lived life, especially if you make sure the few sentences you write each time are concrete ... try a series of notations that allow you at least to acknowledge the though-trails branching off from the main path of an entry." How our 'pattern-hungry minds' impose patterns on what we see. By contrast, try to uncover order. "I've made a game of searching out the ordering principles that underlie natural phenomena." "Discover a link between form and function, the how and the why." Ex:	"Plan one or several expeditions in which your object is to look for patterns. Spend at least half a day in a place that is either well-known to you, or typical of the landscape where you live." Greatly prefers Thoreau's journals to his Walden. See her letter to Thoreau. On Thoreau: "He moves easily between the perceptions of artist and naturalist, without a hint of apology." For capturing change with time, see the example of her cloud log, hour by hour. "To capture the unmeasurable, first you must learn to notice it. Then you must invent ways to how light, shapes, sequences, processes, patterns, and the passage of time -- not to mention colors, sounds, geometries, pathways, interactions, and metamorphoses." "The number-scientists will continue to graph their data, preferring to chart only the measurable world. That leaves the field wide open for Thoreauvian journal-keepers and other alert mavericks to plumb the unmeasurable." This chapter introduces the Event Map, a collage of field drawings and notes that show the time sequence in which they were made. During a day in the field, "I participated in the event by making shapes on a page in response to it". After a day in the field, returns home and goes over her notes, often using texts (like Bent's Life Histories of Birds of North America to learn more about "What's going on?" See her sound tapestry representing hawk cry, three layers of grasshoppers, bees, flies, stream "prinkling" [sic]. Ex:	"An Event Map is an actual map, in that it traces your route through a landscape, as you encounter it. It can be more or less complex in its attention to landforms, but it usually notes, or represents with illustrations or invented map devices, changes in altitude, terrain underfoot, stream crossings, basic vegetation patterns, and basic geology. You keep your eye on the larger landform story: What drainage? What microhabitats in this territory? ... An Event Map won't help you find your way back to a place, because ... its parts don't have to remain in proportion to each other. If I'm snared in a rich web of events alongside the stream, for example, that section of the map enlarges itself and becomes denser. ... [An Event Map] has ties with Australian aboriginal 'songlines' that record time, sequence, and significance ... Its purpose is to create a trail of encounters." "Questions arise and questions are events: make a note of your question along the trail, and what in your surroundings, if anything prompted it." "The tendency ... is to come to a complete stop. If you find you can't go on, that there is too much occurring in your immediate vacinity, just let your route-line end in an explosion of images and observations. I call a 'Rapture.'" "More likely, you'll finish ... with an artifact that looks something like a game board, full of little detours, doublings-back, numbers and letters, enlarged areas, invented textures and patterns; impressions of movement, shape, and gesture; and diagrams reminiscent of football plays. Part of the delight of the Event Map is its tendency to shift emphasis, style, and scale according to the flow of events." "If you would know aught, be gay before it."